This study investigated the effects of alkaline silicon-based amendment (A) and incorporated with biochar (B) on the growth, heavy metal translocation, and accumulation of vetiver grass (Vetiveria zizanioides) grown in multi-metal-contaminated soils. Soil incubation for 6 months and pot experiments for 6 months were performed to investigate the growth and the translocation factor (TF) and bioaccumulation factor (BCF) values of heavy metals in vetiver grown in As-, Cd-, Cr-, and Pb-contaminated soils amended with A (0.5%) and AB (0.5% A; 1.5% B). The vetiver could grow in multi-metal-contaminated soils due to the restriction of metals translocation in vetiver. Vetiver could be the plant for phytostabilization of As, Cr, Cd, and Pb because As, Cr, Cd, and Pb accumulated by the vetiver were largely retained in the roots, as the TF values for As, Cr, Cd, and Pb were < 1; the BCF values for As, Cr, Cd, and Pb were obviously greater in roots than shoots. Application of A and AB markedly improved vetiver growth due to A- and AB-induced accumulation of Cd, Pb, and Cr in the roots, and then enhanced phytostabilization of Cd, Pb, and Cr in roots based on the BCF values, and the immobilization of Cd and Pb in soils based on increase of soil pH and Si-induced accumulation of Cd, Pb, and Cr in the roots. Vetiver represents a candidate for revegetation of multi-metal-contaminated soils amended by A or AB. 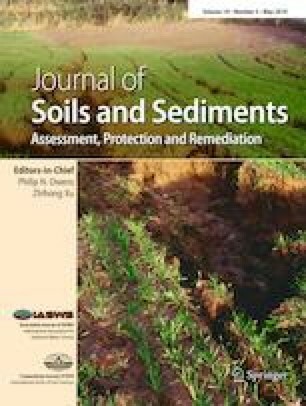 Further investigations are required to determine the feasibility of revegetation in multi-metal-contaminated soils at the field scale. The online version of this article ( https://doi.org/10.1007/s11368-018-2219-5) contains supplementary material, which is available to authorized users. This research was supported by the National Natural Science Fund Projects of China (41571318) and Sino-Danish Joint Doctoral Promotion Programme (Chinese Academy of Sciences).